When I think about how my diet has ebbed and flowed over the years, I realize how much the allure of being skinny has been a frequent road bump on my road to health. Before my Hashimoto’s took its toll, I only thought about my eating habits in terms of what I saw in the mirror. And even back then, my immune system wasn’t always effective at warding off insecurity. In high school, I was a late bloomer. It took until sophomore year to enter maxi-padded womanhood. Over the course of that summer, I grew 4 inches, and between the height and the hormones, gained 15 pounds. Though I was still a beanpole by anyone’s standards, I knew that gaining weight, by any amount, was not a good thing. Around the same time even my most svelte vegetarian friends seemed to be downgrading their salad dressing choices from creamy ranch to straight lemon juice. My costar in the school play, a sweet-faced chubby girl in middle school, had become so bulimic over the course of a semester that she often couldn’t make it out of the rehearsal room before vomiting in a trashcan. When your sole goal is to fit in, it can make your rational self—even a 15-year-old rational self—do somersaults. I started feverishly recording what I ate. I weighed myself every morning and every night to see if the banana with peanut butter from my after-school snack made me “fat.” And I basically cut my dinner portions in half. My mom pretended not to notice. My dad on the other hand, as a Jew, was culturally incapable of watching this go down without pushing platters of carbs in my general direction. “Are you sure you don’t want any more couscous, pumpkin?” he would ask. To which I would reply, politely, by slamming down my water glass and storming out of the room. My surly teenage attitude was the only thing not being starved. Eventually this phase passed. Now that I’m older and wiser, I see what my trigger was. In the month leading up to the school play, my food obsessions were at their worst. I was nervous about the skin-tight khaki Capri pants I had to wear for my costume (not a good look on anyone). But more than that, I was stressed out about the performance. Once the play was over, I went back to focusing my wayward high school neurosis on other things, like art history papers and boys. During the post-college years, when I let my Hashimoto’s run amok, I started dropping pounds at a rapid rate. While gaining weight in high school made me feel like a failure, losing weight felt good, no matter how bad my body felt otherwise. I got a secret thrill that I could once again fit into the jeans of my 15-year-old self. My parents, on the other hand, I could tell were worried that my eating habits had regressed to a time when I wore those pants on the regular. If my stomach hadn’t stopped behaving—and if I hadn’t had the flu all the time and felt exhausted even on the days when I didn’t—I might have kept embracing this weird health loophole of eating whatever I wanted while wasting away. The weight-loss symptom was one of the reasons I dragged my feet for so long before seeing a doctor. Skinny was a great perk that went along with a lot of misery. Eventually, I got on board, and the rest of the recovery story is history. Or, at least you can read about it in The Wellness Project book. I bring all of this up though because weight is a complicated issue for women. No one gets a get out of jail free card. 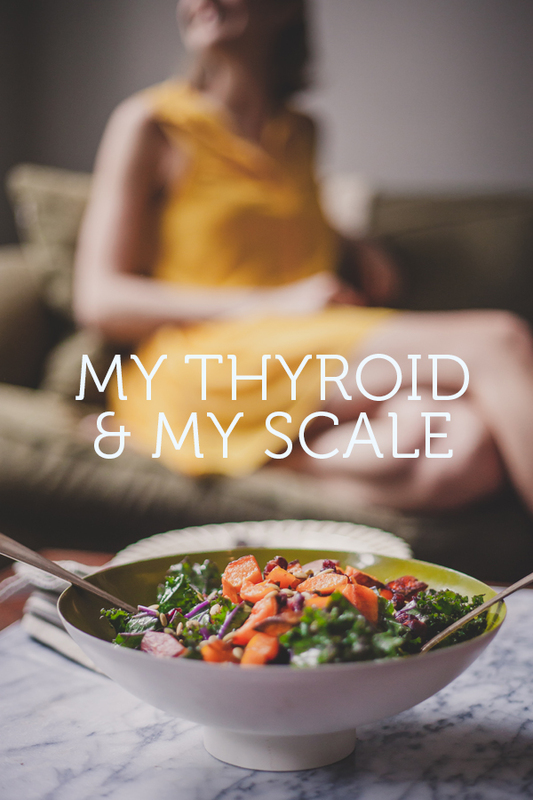 But it’s an especially fraught one for women with thyroid conditions. Most of the time Hashimoto’s (or hypothyroidism) causes you to put on pounds. This might be terrible in the moment, but the one bright side is it might inspire you to actually change your habits. People do exist on the other side of the spectrum though. There’s far less information out there about why weight loss happens (in my case, malabsorption of nutrients due to a very damaged gut). It can be confusing. And it can also distract from the fact that you have a disease. For these Hashimoto’s anomalies like me, and for those who might be jealous of them: just remember that skinny doesn’t always mean healthy. And healthy is far more important. If your doctor just talks about your recovery in terms of pants sizes or uses the word “fat,” I suggest you find someone else. And if that’s how you view your own progress, it’s time to take a long look in the mirror, and figure out what’s standing in the way of your self-love and compassion. Because those insecurities have likely been around just as long as your illness, and in my experience, I’ve learned that it’s hard to heal one without the other. Be well, my Hashi Posse. If you haven’t entered the pre-order giveaway yet, I am choosing a grand total of 50 Winners. I’ll be choosing winners at 8pm EST on May 15th! Happy Mother’s Day for any Hashi moms out there! Instead of breakfast in bed, my daughter brought me a liver cleanse.